To use Red Pill to unlock hidden Windows 8 features, users have to perform the hacks manually, which may lead to error if not careful. 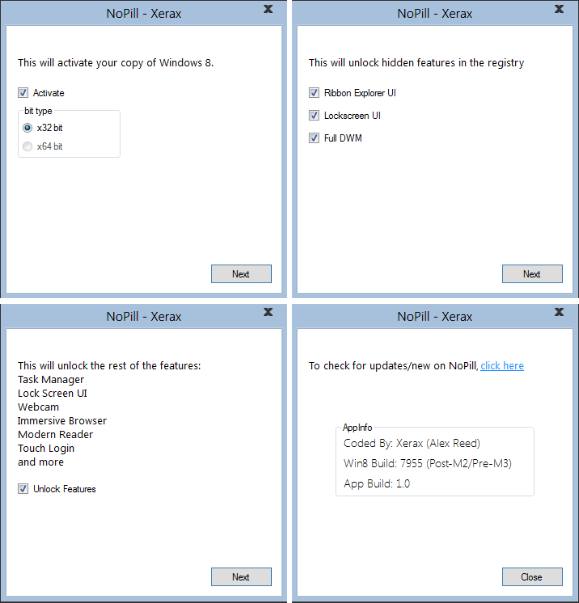 There are now a few automated tools which can automatically unlock locked Windows 8 features on Windows 8 M2 (Pre-M3) Build 7955, and also to activate the Windows 8. BluePill (also known as RedBadge at one stage) is a Windows 8 activator and unlocker made by BlackZer0, and is somewhat related to RedPill made by sCooby^, probably refining the patch to fix more bugs. BluePill is said to be the best unlocker currently available to unlock all known locked features of Windows 8, without breaking or causing issue on activation, Microsoft Security Essentials (MSE), Windows Media Center (WMC), DCE, Aero Peek and Genuine Center, where all of these will continue to work properly, and the system is stable, although there are reports that some problems still arising. 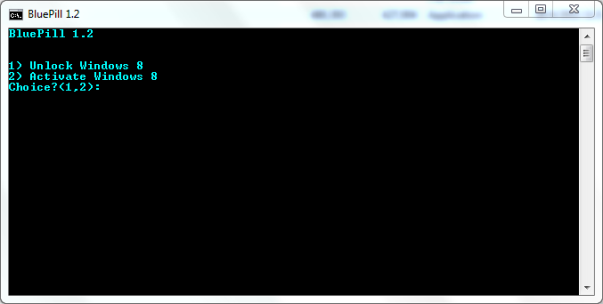 To use BluePill, it’s recommended to activate Windows 8 first (with Windows 7 Beta or RC product keys) before unlocking. The program also provides option to activate Windows 8. If you intend to install MSE, do so after activation and before unlock. Automatic take ownership and full control of affected files. Activation to get genuine Windows 8. Enable Full DWM (No blur on Aero). Unlock Metro UI for Welcome OOBE, Login, Lockscreen and System Settings. Enable Theme Login Screen Image (buggy). The current version of NoPill is version 1.3, and can be downloaded NoPill here: NoPill – 1.3.zip . Future update and discussions of NoPill is available from beta.xeraxic.com or MDL forums.